Beautifully written and astonishingly intimate, Because We Are Bad recounts a childhood consumed by OCD. As a child, Lily created a second girl inside her mind - “I” became “we” - to give order to the fears and compulsions that shadowed every moment of her life. As she charts her journey from checking on her younger sister dozens of times a night, to mentally reviewing lists of hundreds of her perceived wrongdoings, to eventually seeking psychological help and finding new ways to navigate a ... Más informaciones world that refuses to stay in check, Bailey offers readers a nuanced and urgent portrait of an often-misunderstood condition. 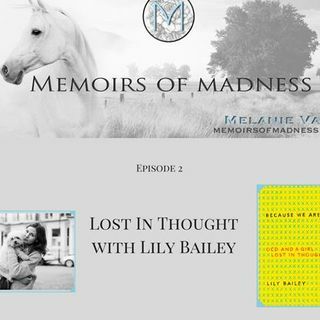 Lily Bailey is a model and writer. She became a journalist in London in 2012, editing a news site and writing features and fashion articles for local publications including the Richmond Magazine and the Kingston Magazine. Lily lives in London with her dog, Rocky. Written when she was just 21 years old, Because We Are Bad is Lily Bailey’s first book. Tune in to hear host, Melanie Vann, and Lily discuss her journey through OCD and how she has been able to overcome her struggles and live a meaningful life.